Don't waste valuable teaching time drawing shapes for Pin Poking and cutting lessons! Simply print this PDF File and cut each sheet into 4 equal parts (full cutting lines are printed for you). 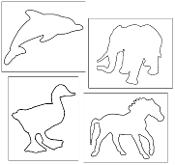 Children enjoy pin poking and/or cutting the animals shapes while developing their pincer grip, co-ordination, and concentration.